Editor’s Note: We’re welcoming Justine back for a guest post! Check out all her previous work on the blog from when she was a student! Even though I can hardly believe it, I have completed my first year of doctorate degree in physical therapy. The year has gone fast and with this post I will share a few things I found helpful throughout my first year in the program. Once you have made it past the application process, your acceptance into a grad program marks the end of the competition with your fellow peers. Getting to know your classmates has many benefits beyond forming friendships. Each of my classmates shares a common interest in physical therapy but our backgrounds and past experiences make us each unique. Some students with an athletic training background are more familiar with sports injuries while others have a background in geriatrics. You can learn from your classmates as they may be able to share ideas or explain concepts you have difficulty with. Another benefit of getting to know classmates is to find other students who have a similar study method as you. A big part of physical therapy is patient education which requires not only that you are able to understand a concept but are also able to explain it to your patients in terms that they will understand. Due to that focus, I would frequently get together with a few classmates before or after our classes to go over lectures and break down the more complicated concepts so we could fully understand the material. Find classmates who have similar study methods as you in order to make your study time the most effective for your learning. This one isn’t much different from an undergrad piece of advice. However, once I started school again I became a bit jealous of my graduated friends working full time jobs without an extra homework load to do in the evenings. This was a change from my undergrad days because at that time all my friends were in school and had times where they needed to study as well. Someday, I will be able to relate to a 40 work week without homework (and a paycheck instead of loans!) but until then I will be spending a little more time with my nose in my textbooks. 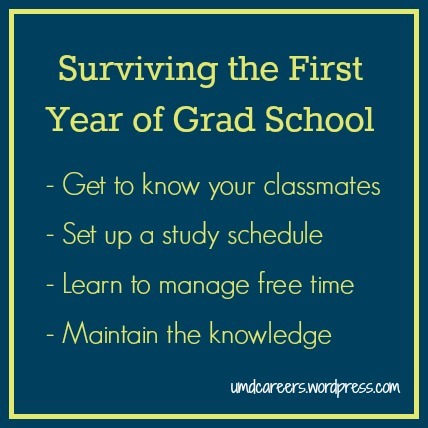 For the time you are in graduate school, make it a priority to get comfortable with a study schedule, with a few study breaks squeezed in for the occasional social outing or get-together with a friend. This is going to be your career field. One of the big switches I had to change in my brain from undergrad to graduate school was commitment to the material. I can confess that in some of my undergrad classes I would hold onto the material until the exam and then it would fade away. Now it’s much easier for me to see the application of the material I am learning, it will help me to understand my patient better and allow me to answer patient questions when they arise. Finding the right career path for you will make learning much more meaningful and purposeful and eventually support a career in a field that you love. One of the most rewarding aspects of grad school is that I’m being taught by physical therapists, in a classroom of students who want to be physical therapists, who will one day be working in a field with people who need physical therapy. It’s a very welcoming environment and after making it through my first year, I know that this is the right field for my future. To anyone else who is starting or continuing within a graduate program, I wish you luck and hope that you find success in all that you do! As sad as it is to say it, my days of being a Bulldog student have now closed. I am now writing to you as an alumna for my last post on this blog. Graduation was a milestone point that came quicker than I had ever anticipated it would. All of the days of hard work leading up to it helped shaped me to be the person I am today, and I am so grateful! I made so many great friends, learned so much from all my fantastic professors, and worked with some of the most amazing co-workers (not to name names here… I’m talking about you Career Services!). I hope that my Bulldog experience is not unique to only myself, I truly desire all current students appreciate their time spent in the UMD halls for all that it can teach you. College is a challenging time when you get to learn so much about yourself, and others, before you enter the real world. Tackle new classes, skills, events, and experiences with enthusiasm and treat it as though it were a necessary ‘qualification’ as your job as a student. Once you find passion in your activities, apply that to a field then transfer that passion to your career. These certainly won’t be my last words with UMD, I will be back to visit, so this is no goodbye. I want to thank you for reading my blog posts throughout the past year, and I hope that you will stay tuned for all the wonderful writers on here that are such great advocates for the work of Career Services! As an office, we will really do all that we can to help you achieve career happiness as a student or as an alumni. To all my fellow 2013 graduates, congrats! As a full time student or a full time employee, you may end up spending a lot of time sitting at a desk. Long periods of time can lead to a bad habit of an overall sedentary lifestyle and increased disease risk. As an Exercise Science major, I could go in depth about the physiological reasons why you should incorporate physical activity into your daily life but there are more effective ways of going about that. Simply put, breaking up your day with a few minutes of activity after a long period of sitting can do you a lot of good. In order to achieve this, you can do something as easy as going for a short walk on your break, or as intense as a session in your office gym-space. Healthy living is part of happy living and not something that you dread, and it’s something that you need to take one step at a time. 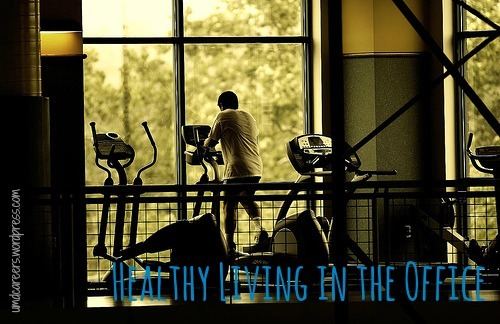 No matter what sort of healthy lifestyle changes you decide to incorporate, make sure that it is something that you enjoy! Many of the students in my Exercise Science major will be pursuing graduate or professional school after graduation. Physical therapy is one the programs that seems to catch the interest of many students as they look forward to improving the lives of others through movement. 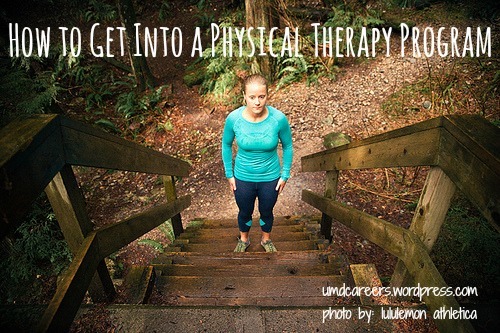 As a very fortunate student accepted to a physical therapy program starting next fall, I want to share my tips of how to successfully manage the ordeal of the application process that will hopefully lead to acceptance! In order to gain insight into the workings of a physical therapy clinic and to fulfill an important requirement you will need to shadow working physical therapists before you apply. These hours can be spent in many different settings: pediatric care, outpatient, inpatient, geriatric care, sports medicine, and more. Hour requirements are different for each program so make sure to do your research and do your best to experience many different areas. These hours might reveal an interest that you hadn’t thought of before! Besides hours spent in a physical therapy setting, other experiences in healthcare and otherwise can really help you set yourself apart from other applicants. Experiences where you are dealing with many diverse people show that you are a strong communicator and would be able to work with patients from all walks of life. Experiences where you have had to teach others such as: coaching, training, or leading, show that you are able to pass on knowledge from the level of beginner. Finding these opportunities can take a bit of searching but it’s important to show your passion and commitment for improving the lives of others. Prerequisite classes may vary slightly from program to program but they usually involve the basic science courses such as biology, chemistry, physics, human anatomy, human physiology, calculus, and psychology. Having good grades in these foundation classes can’t hurt you either! The Graduate Record Examination (GRE) is a standardized test that is required for many graduate programs. 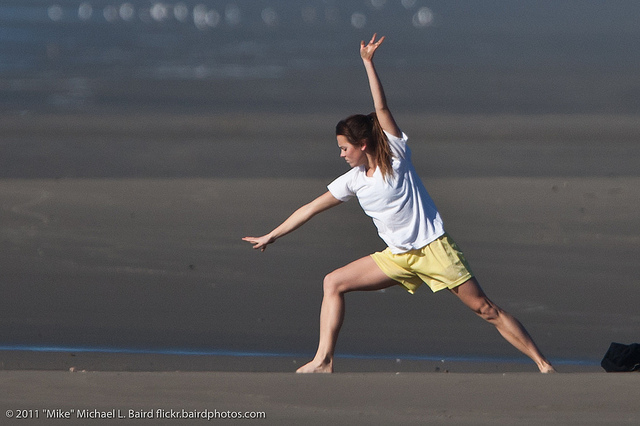 For physical therapy programs you will need to take the general GRE test. You can sign up and learn more about test format and study tips at www.ets.org. There are many study resources out there that will prepare you for this test but I would recommend using the free ones offered on the ETS website first. There are some that are free and come from the same company that is producing the exam so it’s a good place to start. Beyond the website, you can purchase online or paper resources but I would recommend spending some time studying on the computer since the actual test is in electronic format. Physical therapy programs will likely require you to have two or three references that can speak for your abilities and strengths. One of your references will be from a licensed physical therapist so it’s important to build bonds during your observation hours so that you can feel comfortable asking for their help. Other references can include supervisors, academic advisors, professors, or others that can speak in benefit of you. For tips on how to ask for references read How to Find Your References. The required application essays and personal statement were the toughest portion of the process for me personally. If you are like me, make sure to start these essays early and have many people read over them for feedback. Overall, make sure to answer the guiding essay question/topic and that you are writing with a purpose. These essays are a sample of your writing and also offer an opportunity for you to show your passion to pursuing the career of physical therapy. Career Counselors from our office are experts in helping you create your best writing possible and you can access their help by just making an appointment in our office. The Physical Therapy Centralized Application Service (www.ptcas.org) is used by most programs to make the application process much more manageable; but, it is wise to get familiarized with the program early. By starting with your application early and being aware of deadlines, you will be setting yourself up for success. After following these tips for the application process, you will be one step closer to being a physical therapist! 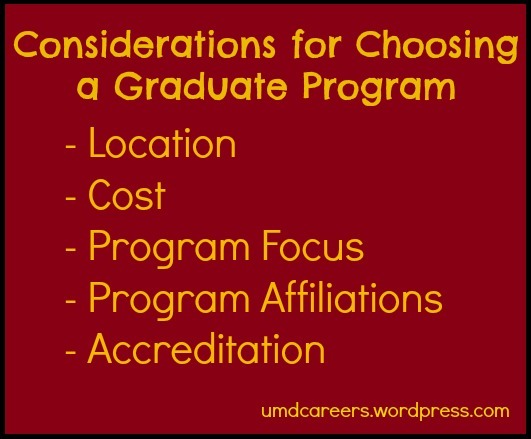 If you are like me and are on the graduate school track you need to know a few things before you make your final decision on a program. Not only are you making an extra time commitment to stay in school but going into a graduate level program carries expenses. However, graduate school can open many more doors along your career path and is a good way to become an expert within your field of interest. Once you have made the decision to pursue graduate school, next you have the decision of what program to pursue. Here are some criteria that can help you find the best suited program for you! Do you want be living somewhere warmer (or colder)? Are you willing to make a big move? Do you want to spend the next few years living there? Would you want to settle down in that area after school? Will out of state tuition significantly impact your financial decisions? Since a graduate level program is often more expensive than an undergraduate degree you might need to consider your finances as part of your decision. Consider talking with a financial aid counselor early on to find out what resources are available to you to finance your education. Also consider applying to scholarships within your program (if available). A program’s focus and goals should align with your own if you want to have a successful match in your years of continued education. Some schools are research based which puts students right in the process of discovering new findings and applications. Other schools might focus more on the interaction and application of knowledge. Decide on what your main objective and experience you want to gain will be and that will help to narrow down on the programs that are right for you. Graduate schools form relationships over the years with certain companies and organizations that can benefit you as a student. If you are required to have internships with these companies it can often be a great budding start to a networking connection that could potentially land you a job after completion of your program. Talk with admissions counselors at the programs you are interested in to see where past students have ended up working. What type of degree you seek will affect the types of jobs you can find and the kind of salary that you earn in those jobs. Standards are always changing for industries so make sure that you are staying on top of what the current trends are, whether certificate, masters, or doctorate level degree. There is a lot of competition in the job market these days so you want to make sure you are putting yourself at the top of the game! Graduate school is a huge commitment and correspondingly a lot of thought should be put into your decision before you make your final call. Career Services has career counselors who specialize in graduate school process and they can be one of your resources for your decision making process. If you have questions, come into our office and schedule an appointment! What Can You Do With an Exercise Science Major? As a senior Exercise Science major it’s an exciting time to see all my fellow classmates making plans for after graduation. Exercise Science majors, for the most part, will have a career full of hands-on work with patients or clients helping them to achieve healthy lifestyles. Most post-graduation plans will take us in all different directions some to graduate programs and some onto full time positions. Do you want to continue on in school? Continued education opportunities can be certification courses, master’s programs, and doctorate programs. What setting do you want to be working in? Who do you want to be working with? Have you ever have a question that previous research hasn’t answered yet? Talk with a faculty member in Exercise Science and apply for a UROP opportunity to do your own research. Research abstracts can also be submitted to American College of Sports Medicine to be considered for student research awards. Work at a local Duluth company or in the surrounding area while getting hands-on experience. Credits can go towards elective credits after approval for your Exercise Science major. On campus and very convenient, RSOP (Recreational Sports Outdoor Program) offers a certification for both through National Exercise Trainers Association (NETA). Semi-annual conference in the Northland region with speakers that cover many topic areas in the field. The club holds monthly events and meetings to spread the knowledge of opportunities of what you can do with an Exercise Science major. If you are looking to get more involved with the Exercise Science major, start by talking with older students and faculty. If you haven’t already joined the Exercise Science club, there are monthly events that provide opportunities to learn more about the field. Additionally, an Exercise Science major can specialize in exercise and sport science; health and fitness; or special interest concentration. Talk with a member of Exercise Science faculty to determine which concentration is best for you depending on what you want to do with your major in the future. Career Services not only helps with deciding on a major but also helps you find out what you can do with your major. If you are on the career route, Career Services has job and internship listings, practice interviews, and resume and cover letter critiques. If you are on the graduate school track, Career Services can help with test preparation, personal statements, and interview tips. For more ideas on what Exercise Science majors can do, look at the Graduate Follow-Up Report to see what past alumni have done with their major. Spring is prime time for job fairs, and one of the big fairs UMD students and recent grads can attend is the U of MN Job and Internship Fair. Whether you are graduating in May and searching for a full-time position, or just looking for an internship, you are going to need an impressive resume. For those who don’t already know, an objective is a purpose statement that is listed as the first thing on your resume. For example, To obtain a ‘position title’ at ‘company name.’ When writing an objective for your job fair resume, you have to think about the many people who you will be talking to and handing your resume out to. In this case, creating customized resumes for each individual company is more hassle than you want to have to deal with on an already busy day. To save yourself the time of shuffling through many different resumes, you can create a job fair resume that has more of a general objective. Something like this could sound like, To obtain an internship in the field of ____. Now your resume goals are now appropriate to fit the many companies and employers of the job fair. By using the word ‘experience’ on your resume as a heading, you are able to include many more positions besides paid jobs. Say, for example, you had an awesome unpaid internship or volunteer position you want to feature on your resume, you can list that under the “Related Experience” heading, which usually comes right after the Objective and Education headings. You can also personalize the heading even more by including your field like ‘Marketing Experience’ or a skill such as ‘Leadership Experience.’ By making these adjustments you will be able to highlight yourself in a way that will set you apart from other applicants. Before any job fair, you need to do your research about the employers who will be there. By clicking on ‘view employers attending’ on the GoldPASS website you can decide who you will want to talk to on the day of the fair. By planning ahead you will know how many resumes to have printed off, plus some extra copies just in case. Think about also purchasing a nice portfolio folder to hold all of your resumes in a professional and organized way. Overall your resume needs to be flawless in order to help build your first impression when meeting employers. Career & Internship Services has many expert career counselors and peer educators who can help you with your resume and job fair tips in general. For more tips and tricks about successfully making it through a job fair experience, check out previous blog posts about what to wear and how to prepare for the big day.